Photo credit: Jeff Chiu/Associated Press as reported by The New York Times on 7/12/18. 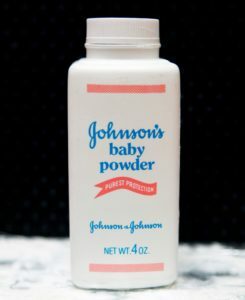 Johnson & Johnson, in one of the largest punitive damage awards in history, must pay $4.69 billion to plaintiffs exposed to talcum-based products which they claimed caused them to develop cancer. Six of the women who sued the company have died, according to The New York Times. Johnson & Johnson, which has successfully appealed a number of similar cases, vowed to file an appeal.